An exquisitely conceived, choreographed and performed piece of acrobatic theater – touched lightly with narrative – by the ever-innovative Montreal circus troupe. They bounce, they juggle, they twist, they climb poles and suspended cloths, they slither, they bend in unbelievable ways, and with a touch of storytelling they convey a sweet sense of context in the course of pulling it all off. The 7 Fingers, the Montreal circus troupe formerly known here by their French name, Les 7 Doigts de la Main, has come to Boston care of ArtsEmerson for quite a few years running now and more often than not they have shown up with a stage full of surprises. Some established routines do surface as part of their performance liturgy – the vertical pole is always present in some form – but they also routinely surprise in one way or another. In this case, under the inspired guidance of director and choreographer Gypsy Snider, they have truly produced a wonderful amalgamation of their most convincing sides and have done so in a way that is artful and endlessly entertaining. It’s hard to believe that so much continuous action is packed into just over an hour and a half (without intermission). The brilliant choreography is apparent from the beginning. Seemingly every available nuance of gesture is explored so that no time or stage presence is wasted without some declaration, articulation, or shaping of the collective space. The brilliant choreography is apparent from the beginning. The set is simple but wittily conceived. Displayed as a three part section of house fronts and interiors which get turned around, separated, and refitted together in endless ways, it provides remarkable flexibility and utility. It also provides enough windows and trap doors for the acrobats to tumble and fly through in a fury of chases. Every edge and crevice is utilized – acrobats jump on trampolines to land on the wall tops, or a woman contorted and encased in an unbelievably lush wedding dress emerges from behind a door in a cascade of unbendings. The reversibility of the panels, as exteriors or interiors, confirms the guiding poetic theme for the piece. The performance is framed by a warmly reflective narrative conceived as an amalgamated tribute to ancestors of the acrobats. Offered as a series of short recitations by the entire cast at the beginning and at the end, it is elegiac, both a tribute and an inspiration, offering a suggestive sense of what has come before, and what has propelled these young people into their current orbits. The notion of looking backwards in one’s family history, of reversing one’s view, prevails as a confirmation of the piece’s title. It’s a simple but wonderfully effective motif that adds, with subtle piquancy, a significant dimension to the production. One performer is more talented than the next. Wielding magical hula hoops, Emi Vauthey catches them on every corner of her being, standing on fingers, toes, stretching whatever might offer a perch for a spinning circle. Vauthey and Emilie Silliau slither on the suspended pieces of silk perform at dual ballet of remarkable drops, twists, turns and everything that one might possibly conceive from a human body wrapped in a piece of fabric suspended from atmospheres high above the stage. There is daredevil skateboarding by Vincent Jutras, and endless rotations, gyrations and interactions among the entire troupe in such carefully timed and well articulated ways that one didn’t know could interact and engage without calamity in such a way. 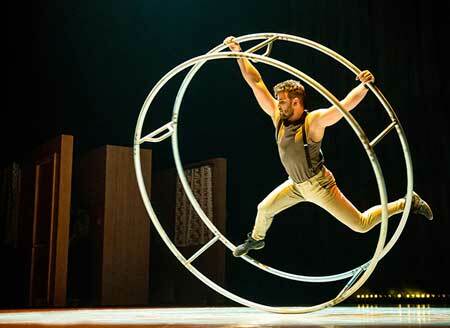 Julien Silliau, in the German Wheel, pulls off a series of maneuvers not entirely new to 7 Fingers audiences but riveting nonetheless, twisting and controlling it with ease. To see this large metallic cylinder manipulated on the floor of a circus tent is one thing, but to watch the massive untethered thing spin before one on a raised stage is quite another. Natasha Patterson juggles with large red balls, slithering them along her arms in ways that defy gravity. Vincent Jutras puts three, four,five, seven balls in the air, swishing and gyrating them with oily dexterity. Maria Del Mar Reyes managed to stand on one hand enough times to make one exhausted watching it, then came back immediately to engage in more collective hijinks. Don’t these people have rest periods written into their contracts? The cast, consisting of four men and four women, is utterly lively and delightful. The cast, consisting of four men and four women, is utterly lively and delightful. A charmingly international crowd, they mostly speak to the audience in English, but Del Mar Reyes for the most part delivers her tributes mostly in Spanish. This is one of the best 7 Fingers performances, so totally nuanced and completely well-balanced between the hint of narrative and the inclusion of an abundance of routines. On past occasions, 7 Fingers has, from time to time, played around a bit too much with audience interaction and other forms of narrative that have shoved the more dramatic acrobatics to the side. Not so here. This performance is beautifully conceived and executed, exhibiting the very best that 7 Fingers has to offer, which is a lot. For circus, juggling, acrobatic enthusiasts, this is a performance not to be missed, and certainly well worth it for almost anyone.